Last year it was “the dress,” this year it’s the pillow. With the swipe of a finger, you can paint a sequin design on these pillows (below) from SoCal-based designer Aviva Stanoff. Dallas reporter Steve Noviello found the pillows at Nebraska Furniture Mart with his video going viral at over 31 million views. 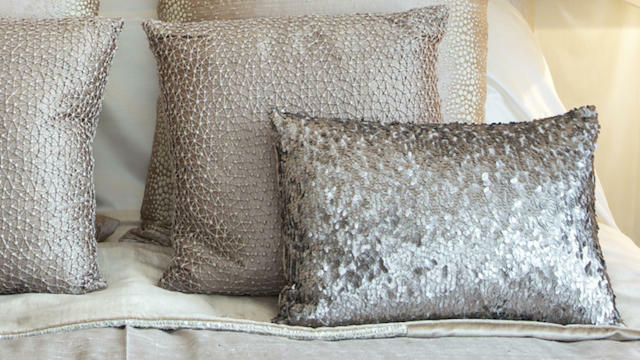 The Two Tone Mermaid Sequin pillows retail for $49. Reversible sequins have been around, but they’re only now blowing up. Vince Camuto takes the magic to this sheath dress. If the price tag for the designer pillows is too steep for your mermaid dreams, you can find a more on Etsy. ////////////////////////Just in time for Valentine’s Day. ////////////////////////Press play for Etch A Sketch action! Came across these changing "mermaid" pillows at Nebraska Furniture Mart. Amazing or horrifying? UPDATE: Nebraska Furniture Mart now has these online from original designer Aviva Stanoff Design as shown in the video.